Let us not waste our time in idle discourse! (Pause. Vehemently.) Let us do something, while we have the chance! It is not every day that we are needed. Not indeed that we personally are needed. Others would meet the case equally well, if not better. To all mankind they were addressed, those cries for help still ringing in our ears! But at this place, at this moment o f time, all mankind is us, whether we like it or not. Let us make the most of it, before it is too late! Let us represent worthily for once the foul brood to which a cruel fate consigned us! What do you say? 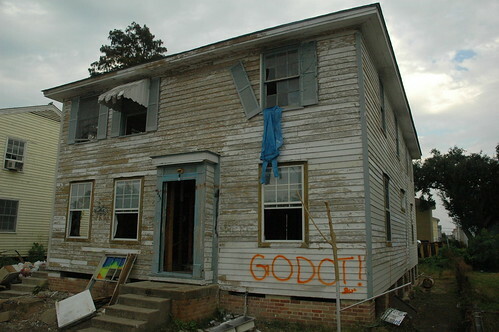 Waiting for Godot in New Orleans was a series of site-specific performances that took place in New Orleans in 2007. Conceived and organized by the American artist Paul Chan, it embodies his creative response to the city’s ongoing dysfunction as well as its inhabitants’ collective tenaciousness in the aftermath of Hurricane Katrina. Visiting New Orleans for the first time in November 2006, the artist was struck by the disquieting stillness of what should have been a typically busy, noisy urban center. He soon envisioned an outdoor performance of Samuel Beckett’s legendary play, Waiting for Godot. For nine months he worked with local New Orleanian artists, activists, and organizers to formalize the play’s production, as well as to broaden the social dimension of the project. The 2007 New Orleans production continues the presentation of the play in similarly charged environments, including one in San Quentin prison (1957), a performance directed by Susan Sontag in war-torn Sarajevo (1993), and the Classical Theatre of Harlem’s post-Katrina inspired production in Harlem (2006), which featured New Orleans native Wendell Pierce. Five free site-specific outdoor evening performances of Samuel Beckett’s Waiting for Godot took place over two weekends in November in two New Orleans neighborhoods – the middle of an intersection in the Lower Ninth Ward, and the front yard of an abandoned house in Gentilly. The project evolved into a larger social production involving free art seminars, educational programs, theater workshops, and conversations with the community. A “shadow” fund was given to local organizations for rebuilding efforts in neighborhoods where the play was presented. Waiting for Godot in New Orleans: A Play in Two Acts. A Project in Three Parts, was co-produced by the NY-based public arts organization Creative Time with curator Nato Thompson, and The Classical Theatre of Harlem with director Christopher McElroen, featuring New Orleans-born actor Wendell Pierce. It was produced in collaboration with New Orleans’ partners: University of New Orleans, Xavier University, Dillard University, NOCCA High School, Lusher High School, Frederic Douglass High School, John McDonough High School, Students at the Center, Neighborhood Story Project, The Porch, and Renaissance Project.